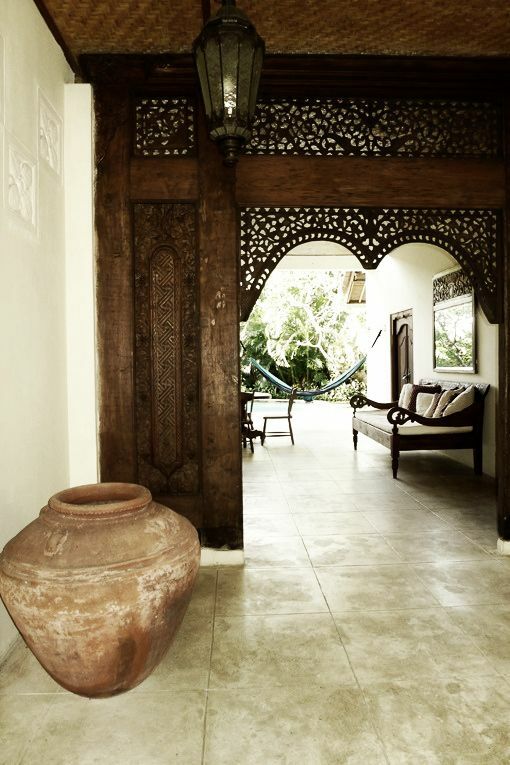 Beautifully evocative, Moroccan style is simply stunning. The richness of the colours, the classic lines of the architecture and the exotic furniture designs make this one of the most interesting of all the global decorating styles. Difficult to replicate in its entirety, there are nonetheless many features from this look that we can introduce into our own homes, wherever we may be in the world. The appeal of Moroccan style to designers around the globe probably stems from the influence that France had on the country, particularly in the early part of the twentieth century. The colours, designs and architecture created by the Moors across North Africa have been tempered here by French design and the outcome from this fusion of two beautiful styles is magnificent. 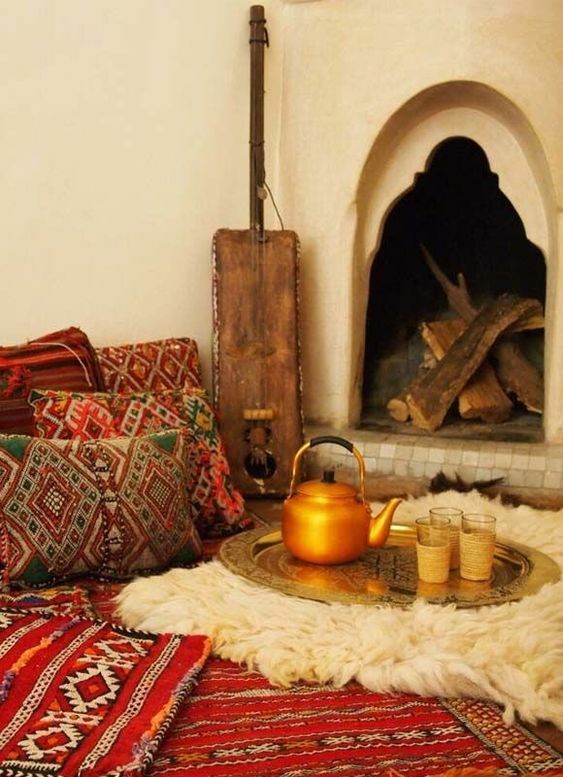 The design and colour palette of Morocco is soft and relaxed and can therefore be incorporated very well into many global styles including Australian country style. 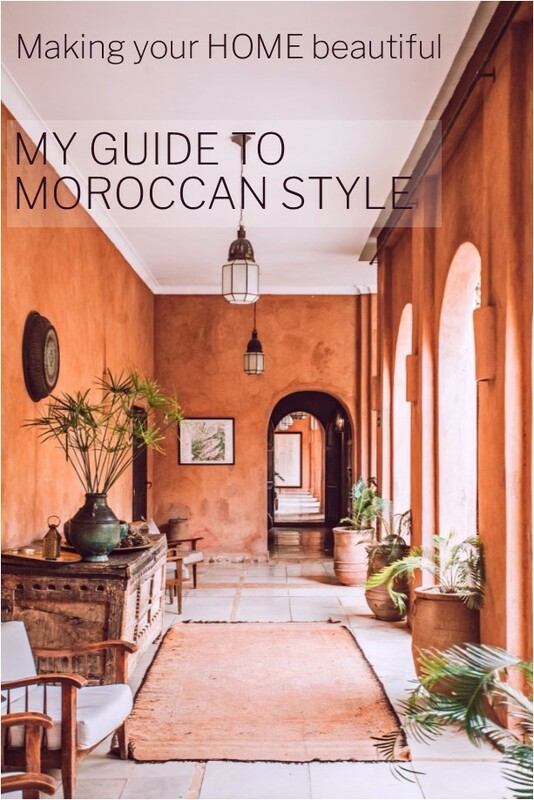 I’m taking a look at the fundamentals of Moroccan style and how they can be adapted to suit homes in other parts of the world. There are elements that many of you will have used at some stage as the style in certainly an enduring one. 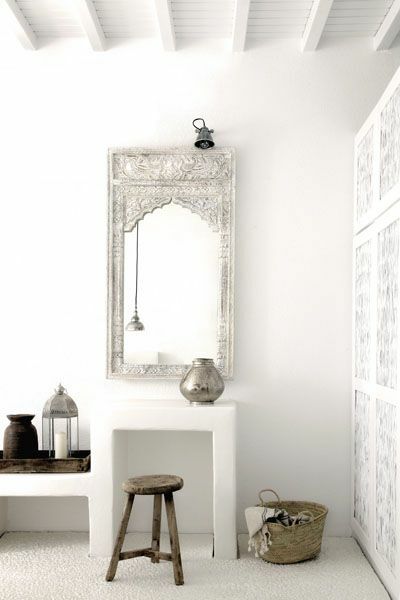 One of the simplest ways to evoke a Moroccan style is to replicate the colour palette. The thing I love about regional styles is that rather than adopting what is popular at the time, they take their colour palette from local resources and therefore the style naturally works in their environment. Using local stone and resources in our building projects is something we should all be aiming to do. In this way a property sits naturally in the landscape and immediately belongs. Morocco undoubtedly has one of the most evocative colour palettes as colour is intrinsic to the way of life there. 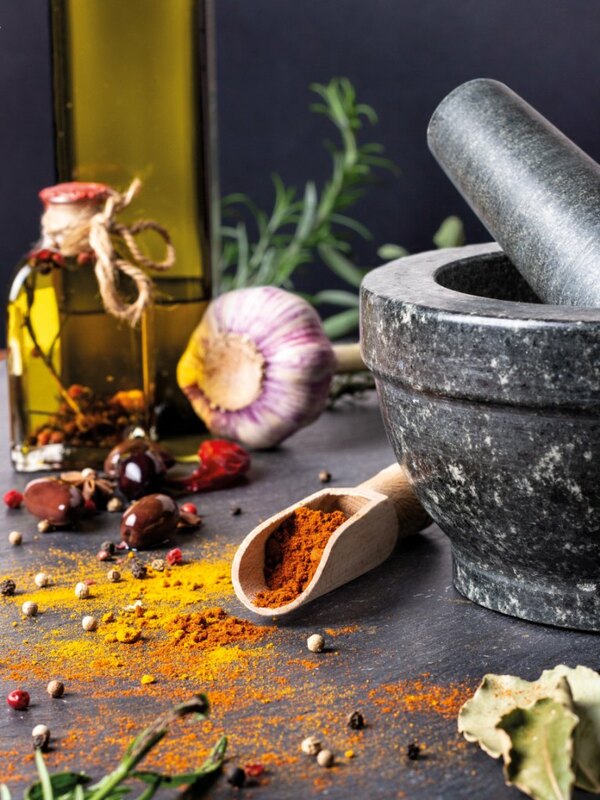 Conjure up images of exotic spice markets with terracotta bowls laden with cinnamon, turmeric, saffron and nutmeg and you have the foundations of a typical Moroccan palette. Terracotta derived from the natural clay of the country ranges from soft pink to a deep fiery red ensuring this is also one of the warmest colour palettes around. The bright, highly saturated, colour in the palette is derived from the beautiful intricate designs of the tiles which adorn many surfaces, horizontal and vertical, both inside and outside. Cobalt blue, bright red and emerald green are typical colours used in Moroccan tiles and inject stunning uplifting hues into the earthy heart of the colour scheme. 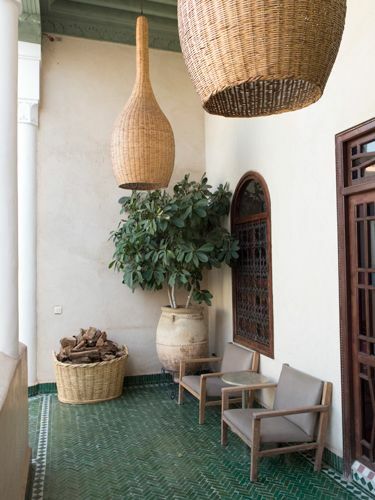 Walls in Morocco can also be whitewashed with accents of green which is the colour of Islam and blue, a traditional colour throughout the Mediterranean. Mirrors are typically framed with embossed cool metallic finishes which bring a cool contrast to the richness of the palette. The casual breezy beach house in the above image has taken its cue from the colours and design of Morocco. The silvery tones combined with the Moroccan style tile and the ornate counter stools evoke the look without the full rush of colour. As the majority of colours in this palette are from natural pigments it is essential to use paints from natural sources, made by traditional methods, to successfully replicate the look of Morocco. The finish should be as natural and as matt as possible. Porters limewash and distemper finishes would work well in this situation as they create a soft and weathered patina. 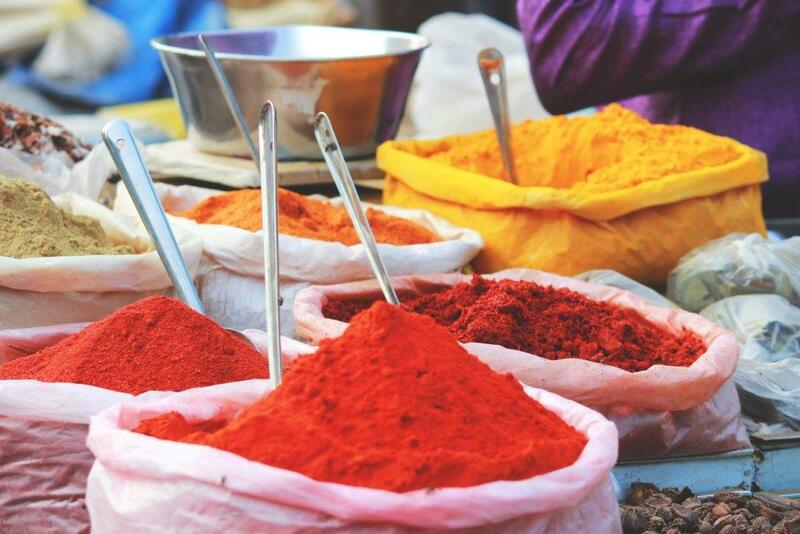 Their colours of Fired Earth, Turmeric, Vatican Blue and Villa are perfect examples of classic Moroccan hues. Limewash paints bloom, particularly when applied in warm climates and the bloom (variation in the colour) is more prominent in darker tones. 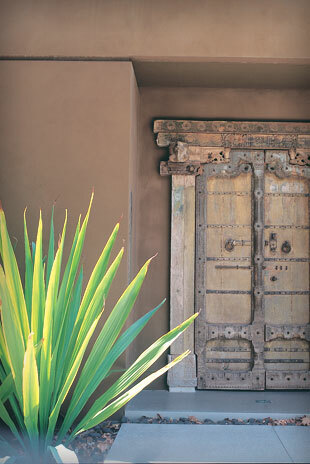 This finish gives you a soft, imperfect look, which if you are evoking a Moroccan style, you really do need. The same rich colours in a solid paint finish can appear harsh and too vibrant. Walls are often in natural terracotta tones with furniture and accessories in brighter colours – very often blue and green. 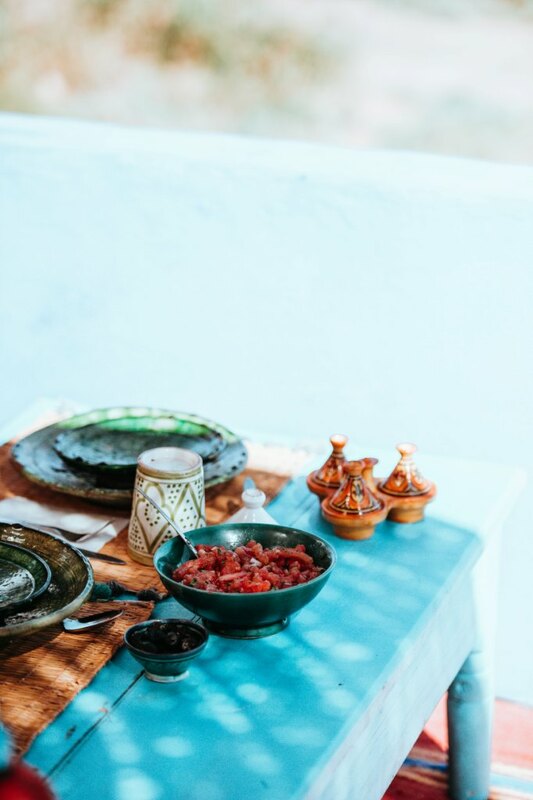 The general lifestyle of Morocco also sets the tone for the colour palette with the strong and bright colours of the marketplaces, where tables heave with natural produce and exotic brightly coloured spices. Australians are obsessed with street appeal. The exterior of their homes are given as much thought and attention as the interiors and this is completely at odds with much of Mediterranean style. Areas of Spain, settled by the Moors, all of North Africa and some other parts of the Mediterranean have very modest, often somewhat unwelcoming facades with peeling paint and enormous impenetrable front doors. However once you are admitted inside the look and feel of the building changes beyond measure. Intricately carved timber panels are an integral part of Moroccan architecture and are used in doors, windows and screens as well as furniture and accessories. 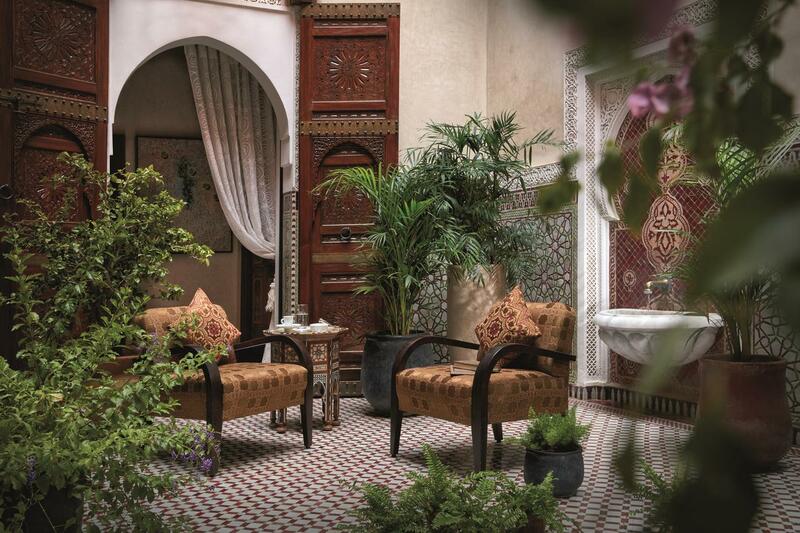 Traditionally Moroccan homes are built around a central courtyard. 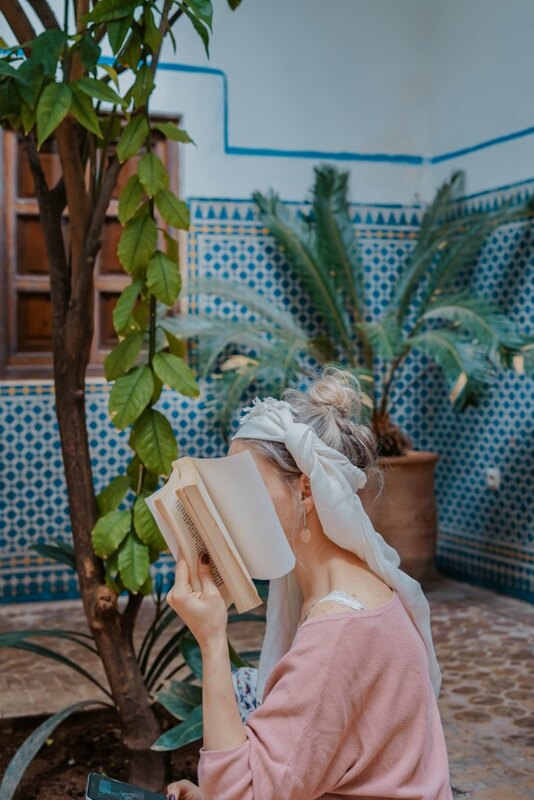 Running water from central or wall mounted fountains, open walkways, decorative tiled walls and lots of greenery to cool things down, are features of a Moroccan home. A mixture of natural timber, handmade tiles and natural stone are typically found in these settings. 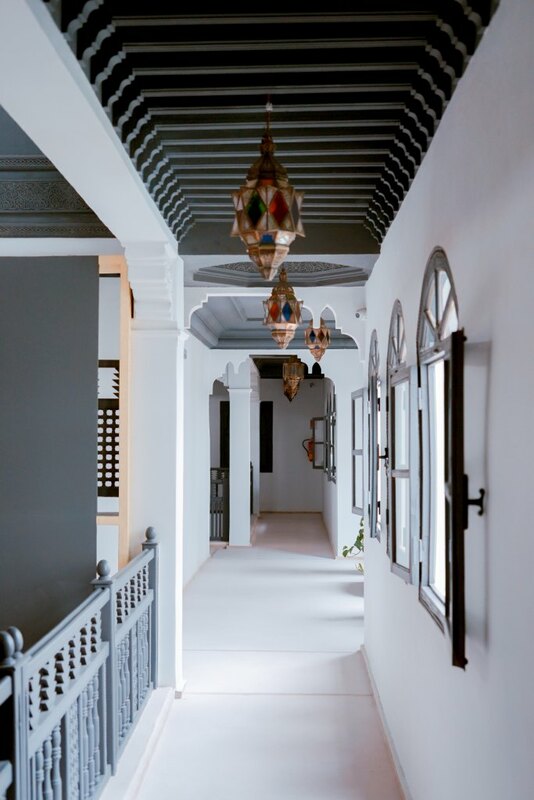 Contemporary Moroccan style is often slightly paired back with simple whitewashed walls that are the perfect backdrop for the arched shaped timber windows and decorative panels. The absence of strong colour highlights the architectural features of the style. 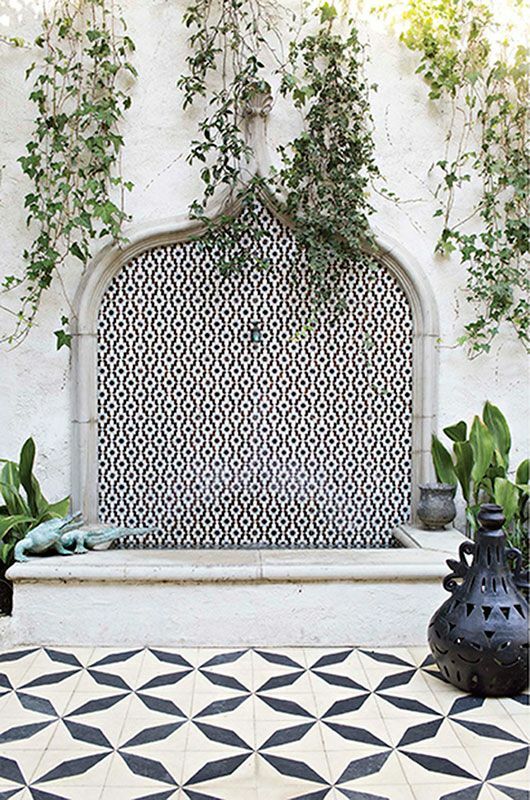 The one element that we have brought into Western styling, more than any other, is the Moroccan tile. 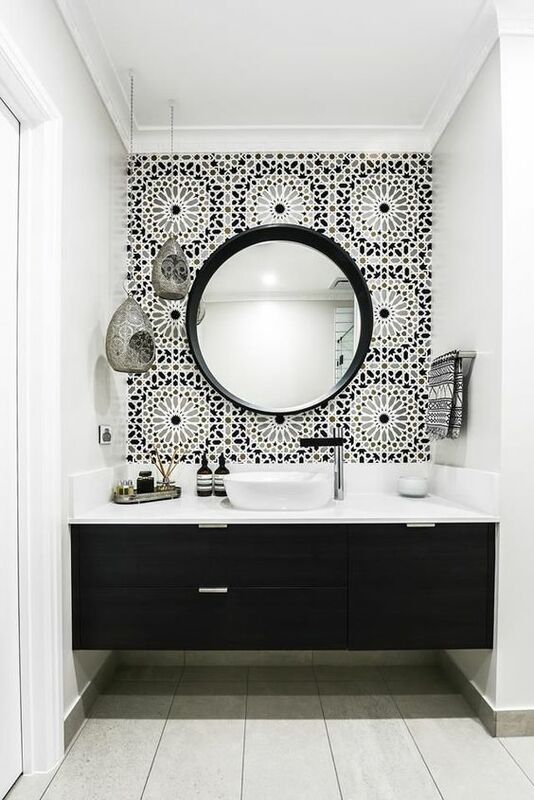 Beautifully evocative, even in a more restrained monochromatic black and white version, the Moroccan tile can transform a classic white bathroom or kitchen into an exotic space. 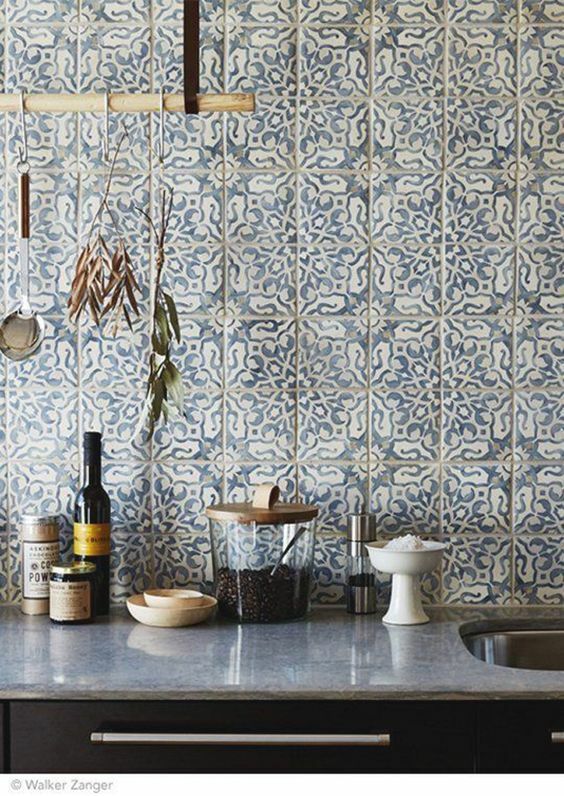 A Moroccan inspired tile is a great statement piece for a kitchen splashback or as a feature for the face of a kitchen island. 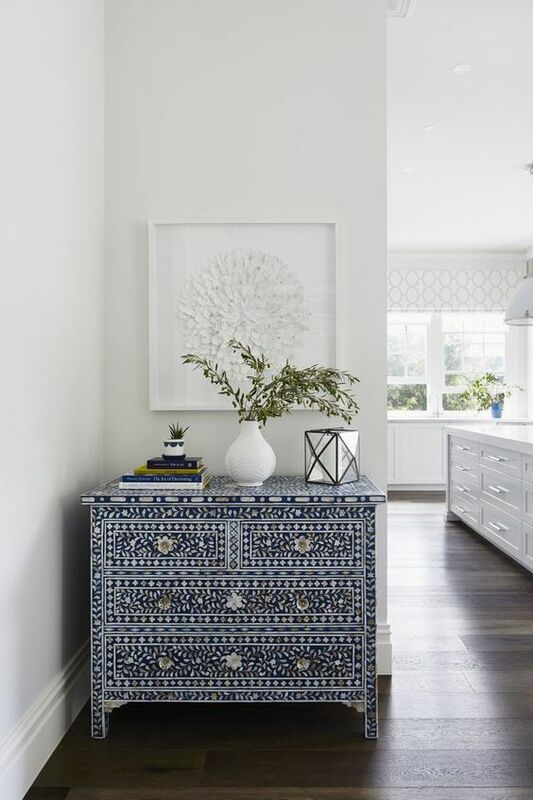 Remember the adage that less is more and incorporate just a touch to introduce an exotic element that lifts an otherwise plain scheme and brings a touch of Morocco without being overwhelming. 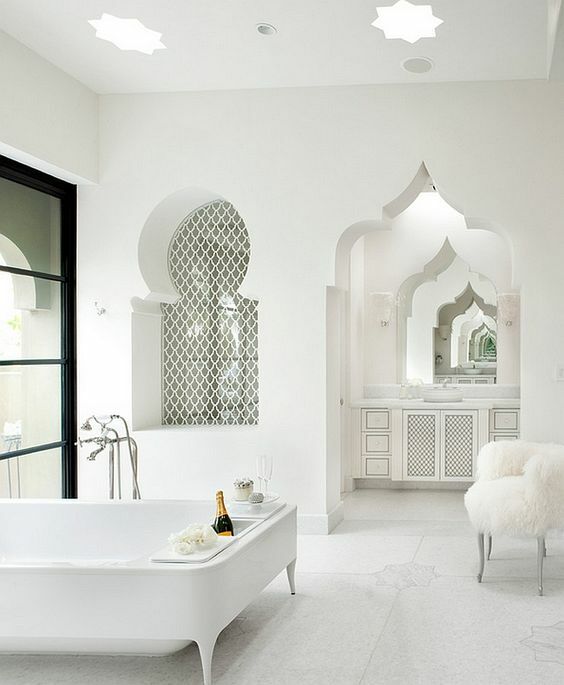 By simply introducing the unmistakeable Moroccan shapes into a scheme you can bring a striking look to an all white scheme. 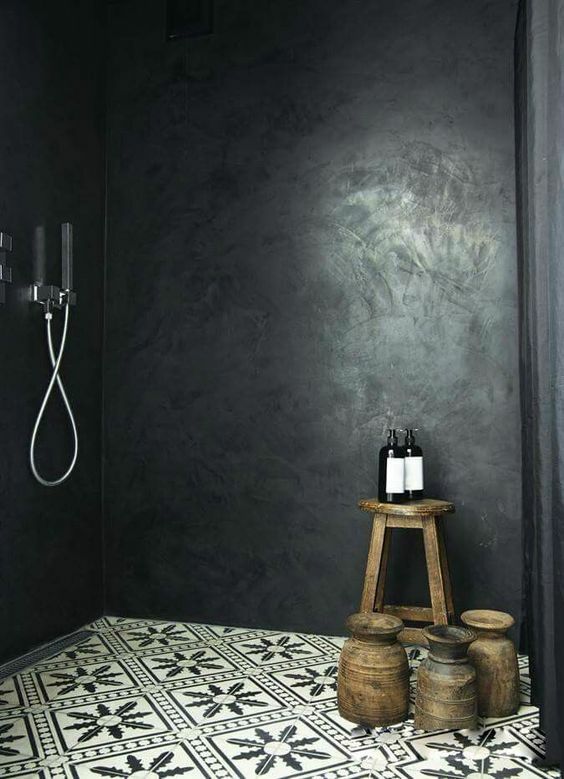 However you can see that even with a contemporary built bathroom or kitchen with classic, simple straight lines, you can introduce a touch of Morocco with their tiles. 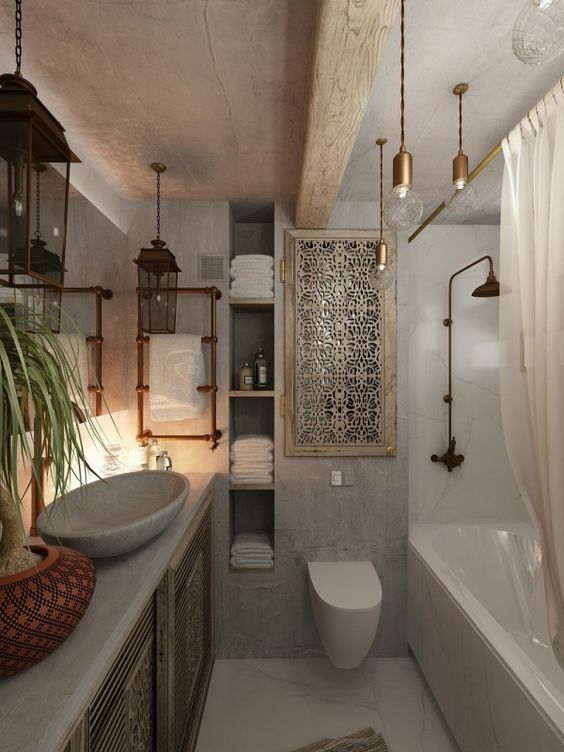 Introducing some fretwork and Moroccan style lanterns into a bathroom brings a Bohemian feel to the space. 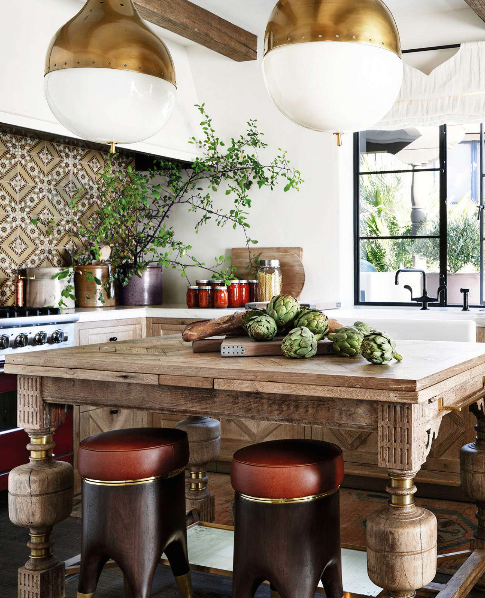 Bohemian style, a current universal favourite, owes a lot to Moroccan style. 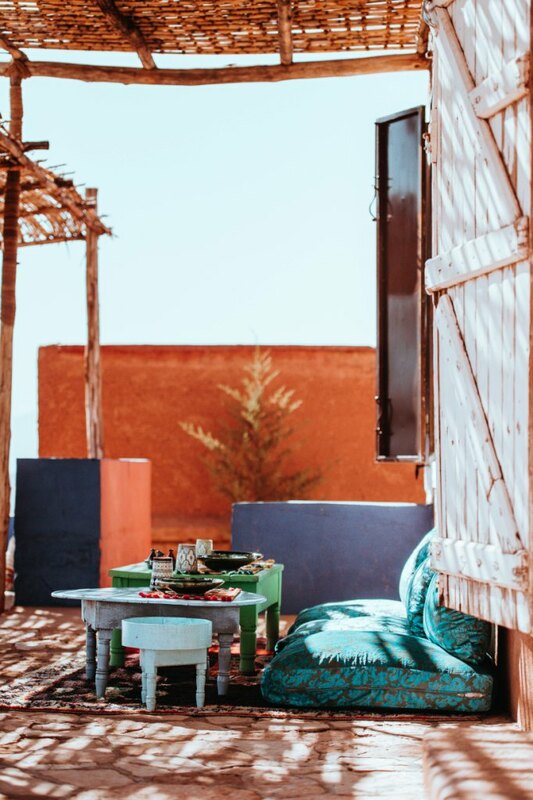 Floor cushions, Moroccan patterned rugs, low seating, Kilim cushions and soft chalky white walls are all elements of Bohemian style and have a firm connection with Morocco. Mother of Pearl furniture, although usually from the Sub-Continent, also evokes Moroccan style as it mimics their beautiful tiles. When partnered with simple lanterns and Moroccan inspired rugs you achieve the look of this style. 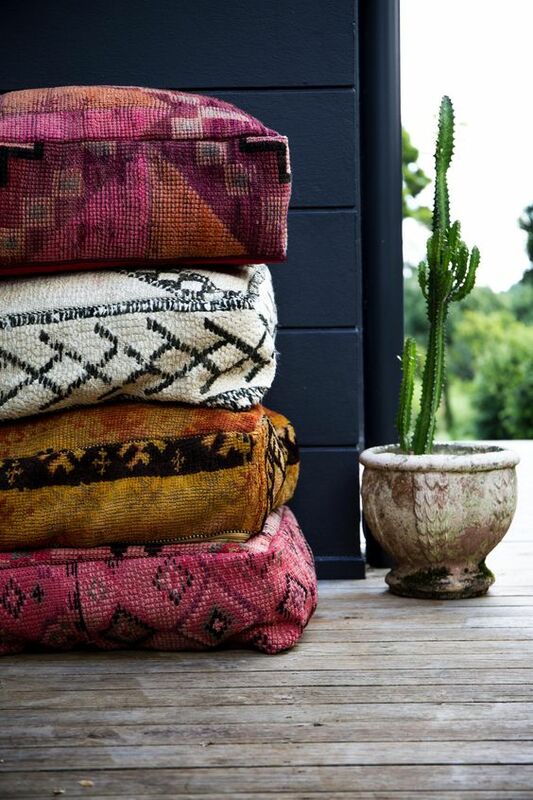 Kilim cushions and rugs, the mainstay of the Bohemian look, are also very much a part of Moroccan style. The richness, warmth and variety of the colour palette and the tribal patterns evoke this look. Moroccan patterned rugs, when partnered with low seating, are other elements that go towards this style. Even in a very contemporary setting these inclusions evoke Moroccan style and bring a touch of the exotic to an otherwise sleek and modern look. I hope that this post has inspired you to introduce some of these beautiful elements into your decorating schemes. I have an entire board on Pinterest devoted to this look if you are inspired to research it further. 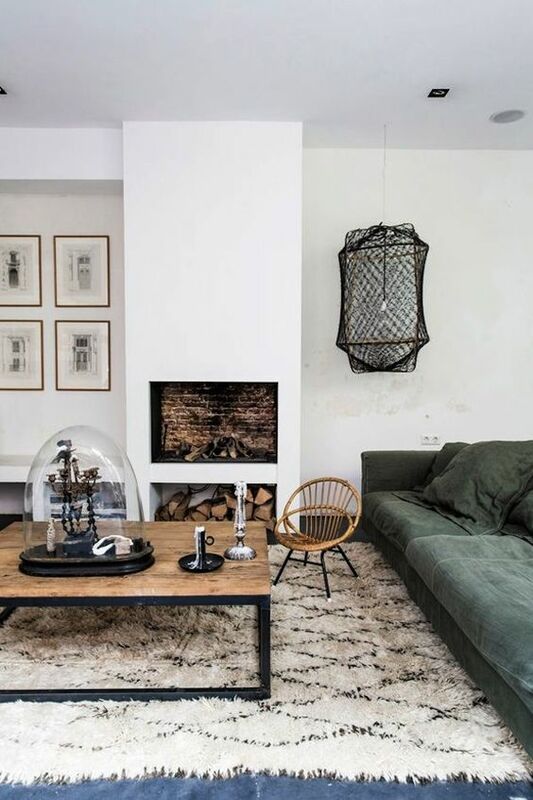 I would love to hear if you have any questions or if you have any elements of this style in your own home.